Underground Airlines by Ben Winters imagines an America where the Civil War never took place. Abraham Lincoln was assassinated while fighting to abolish slavery, and modern day America is now made up of 46 states where slavery is illegal and 4 Southern states where it is not. The narrator, Victor, was a slave in a meat processing plant in one of the Hard Four, and he managed to escape several years before the book opens. He was eventually caught in Chicago, but instead of going back to the factory, he made a deal with the U.S. Marshals: he’ll become a slavecatcher – someone who tracks down runaways – and has a chip inserted into his neck so that the government can always find him. He’s free, but not free. He’s a slave, but not a slave. When Underground Airlines opens, Victor has been assigned to find a runaway in Indianapolis. As the case evolves, he discovers details missing that suggest that the man he is looking for – Jackdaw – is not the typical runaway slave. From there, Victor is drawn into an increasingly complex web of underground abolitionists, double agents, unethical government agencies and people willing to give up their lives to the cause of undermining the slave economy. He finds himself ultimately returning to the South and going back “behind the fence” to try to solve the case, although who he is working for – and whose directions he is following – shifts throughout the book, keeping the reader guessing. I commend Winters on the creativity behind Underground Airlines. His depiction of institutionalized slavery is chilling and deeply offensive, but also sadly realistic. He included the fictional legislation ensuring slavery will continue legally into perpetuity, and also traced the global economic forces brought on by U.S. slavery and their ramifications throughout the 46 free states. I am always impressed with writers of dystopian fiction who are able to conjure up whole worlds different from our own and convey many layers and levels of those societies. Victor was a complex and interesting character, and I also liked being in his head. I am not a big fan of thrillers, so I wasn’t as crazy about the parts of the book involving escapes and gunfights and beatings and violence. Not my thing. 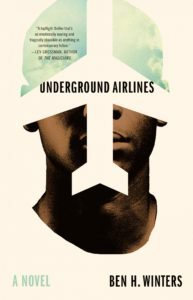 It wasn’t gratuitous in Underground Airlines– slavery is violent – but again, not my favorite thing to read. That said, the violence was relatively contained so I was able to get through the book. I also had trouble tracking a few of the plot twists, but ultimately, I think I understood it. There’s a pretty big reveal at the end that explains why the stakes were so high in this particular recon mission, and I am proud to say that I followed it! Yay me. I listened to Underground Airlines on audio, and the narration by William DeMerritt was SO good. His ability to transform realistically into so many different characters – white or black, young or old – was pretty amazing (though I didn’t love his narration of a female character named Martha). He did an excellent job with this book, conveying Victor’s anger, helplessness and intelligence as needed throughout the story, and like Victor, he never lost his cool or his consistency. I highly recommend the audiobook of Underground Airlines. This was a pretty good read, overall. I am not sure I would have picked it up had I known it was as much a thriller as dystopian/moderately realistic fiction, but I am still glad I read it. Thought-provoking, especially at a time when so many of our institutions seem to be at risk. One of the books with a lot of buzz going in to BEA this year was Homegoing, by Yaa Gyasi. It is definitely one of the hot books of June, and for once, I actually read a book right when it came out! Shocking. Homegoing is a sweeping book about the legacy of slavery in Ghana that covers 300 years tracing the ancestors of two half-sisters. One, Effia, married a British colonist and moved to a life of relative luxury, while her half sister, Esi, is sent to America ship via the slave trade, where her children and grandchildren are raised as slaves. The book follows the two threads of the family tree as the generations are born and the decades pass. The chapters alternate between Ghana and America, with each chapter devoted to one person from each generation. Homegoing is an admirable novel, and I enjoyed it and am very glad that I read it. Gyasi powerfully depicts the shameful legacy of slavery and racism in so many contexts, providing a rich and, at times, almost unbearably painful picture of how deeply they have affected society over the last few hundred years. The African chapters trace European colonization, the slave trade, tribal warfare and poverty, while the American chapters loko at slavery, Jim Crow, racism, the Great Migration and the civil rights movement. The two threads come together in the end, when the present day descendants of Effia and Esi meet and decide to return to Ghana and, unwittingly, the place where their ancestors were originally entwined. This is not a light read. I commend Gyasi for her meticulous construction of these parallel paths, and how the dual plots unfold in lockstep despite the thousands of miles and cultural abysses that separate them. Her chapters are almost like short stories, since each one introduces a new character (and a new type of injustice), but the stories are linked both in theme and in genealogy. I think that the wide cast of characters may have made the book less enjoyable for me, as every time I had to re-establish where I was in the family tree (luckily included at the front of the book) and the historical context for the latest installment. This construct made the book a little harder to get into. At the same time, I learned a lot that I didn’t know before, such as that freed slaves in the South were routinely convicted of petty crimes and forced to work in coal mines for years to pay off their fines, effectively reestablishing slavery despite its illegality. There is a lot of unforgettable horror in here, but there is also love and hope. 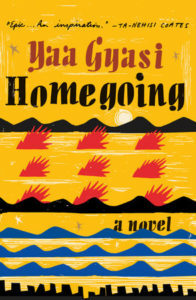 Homegoing is not a simple book: Gyasi offers a textured portrayal of black Africans who traded their own people to Europeans and light-skinned black Americans who forsook their roots and abandoned their children to avoid the impact of racism. I listened to Homegoing on audio. The narrator, Dominic Hoffman, ably handled both continents, adopting one accent for the African chapter and another for the American ones. I thought he did an excellent job. HIs voices for men, women, children, white, black – all seemed accurate and authentic. Overall, I really recommend Homegoing. It’s not a beach read, so save it for when you’re looking for something you can really think about and digest.